Treasures from the Nobel Museum's Collections. In 1994 Wole Soyinka found himself fleeing from the Nigerian regime. As he fled, he hid his famous hair under a hat to escape detection. When we asked the Literature Laureate for permission to display an object that was meaningful to him, he chose this hat. Medicine Laureate Barry Marshall selected a beaker he used in his research into a bacterium that causes gastric ulcers. Peace Prize Laureate Kofi Annan chose a bracelet that symbolises the key to life. These are just a few of the objects on display in the new exhibition Items for Your Consideration. His hat is our gateway into Soyinka’s life and authorship, just as the beaker is our gateway into Barry Marshall’s work, and Kofi Annan’s bracelet is our gateway into his efforts to promote peace. Soyinka wore his hat to avoid drawing attention to himself. At the Nobel Museum, this same hat will instead become an item for your attention and consideration. 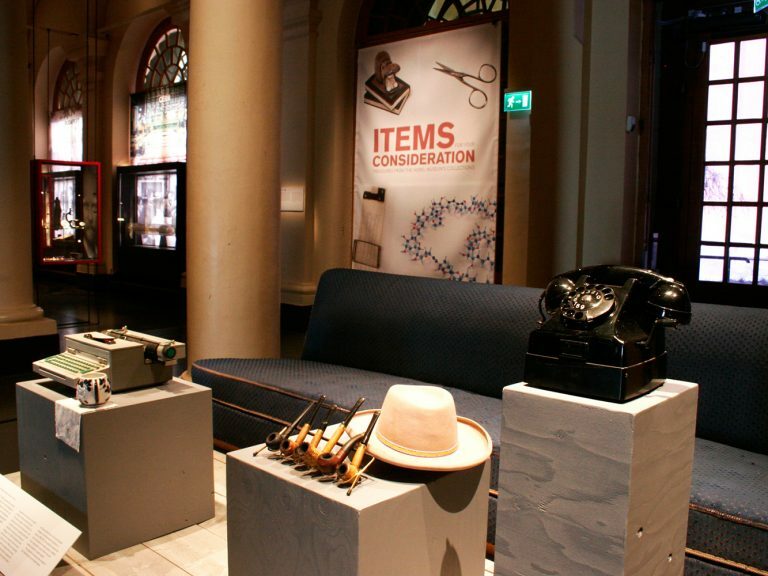 In the ten years since the Nobel Museum opened, we have collected artefacts, images and other material from Nobel Laureates. We are now using this material to retell the stories of more than 20 of these Laureates and their work in this new.